Hybrid cars are becoming more and more popular. Hybrids are are beneficial for the environment and can make a great difference the more the people decide to use them. There is simply one problem, and that is how small the typical hybrid car can be. For those who have limited themselves due to size, there is a solution that may be coming into play very soon. Our planet is precious and significant to us, this means it is crucial that we do what we can to keep it healthy and in it’s best condition to sustain life. By next year, there is a great possibility that we may be seeing full-size electric pickup trucks. It has been tested and according to USA today, Via Motors are just about ready to release these unique electric vehicles with as many as fifty different commercial fleets. Via Motors will start the production and begin the deliveries by next year, this is exciting news for many buyers and companies around the country. The system allows up to forty miles of range on a full amount of electric power, but this may depend on the application. It can also use the 4.3-liter V-6 gas-powered engine to charge the batteries at a quick pace for additional distances. Via Motors will more than likely keep themselves visioned on the commercial market for a while before heading in the direction of any type of personal-use, non-fleet buyers. But this does not bring forth any limitations. 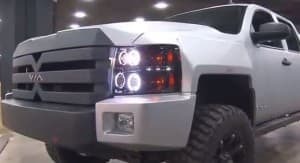 The more these full-sized, electronic pickup trucks are tested as commercial use, there is a better foundation for personal buyers in deciding whether or not to purchase them. This is bringing us one step closer in bettering our precious planet. With the strong holds that keep people from doing what they can to play their part on this planet being broken, we are reaching a new awakening in terms of our transportation. This is an awakening that will make a positive impact on how people get from point A to point B and also on our planet. Along side with helping to keep our environment safe, there is one other problem that this will solve that people are facing through out this entire country. Gas has become such an issue, and these hybrid vehicles take that weight off of the drivers’ shoulders. In 2014, full-sized hybrid pickup trucks will be making their appearance here in the United States.